Salt River rallied to tie it at 6-6 with a run in the 9th, then collapsed in the 10th as the Rafter relievers gave up six runs in a 12-6 loss to the Mesa Solar Sox. Carter Kieboom (pictured) extended his hit streak to five games with a another three-hit game, as he singled twice, doubled once, and scored twice. 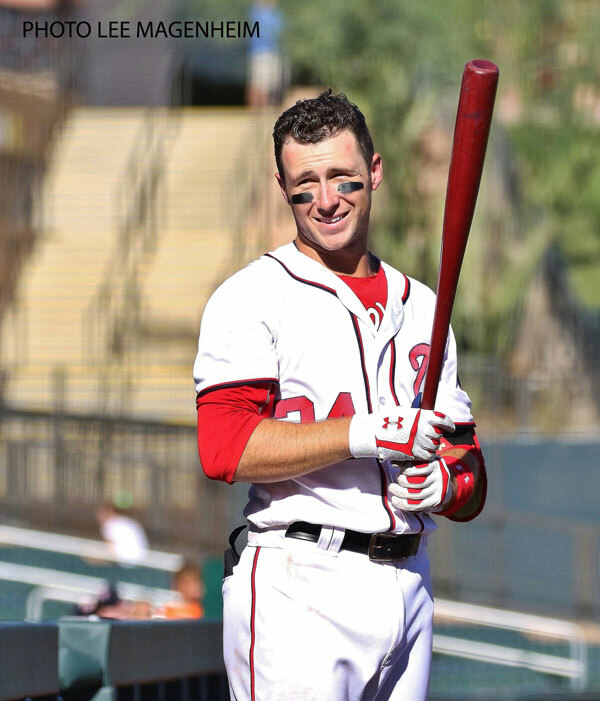 Alas, he also committed two errors while playing second base, so Daniel Murphy returning for his favorite promotion at Nationals Park in 2019 may still be possible. Tres Barrera also made the start at catcher and reached base twice with a double and a walk. He did not throw out the only baserunner who attempted to steal against the Rafters battery. The loss dropped Salt River to 11-8 but they still lead the AFL East by two games. Luis Reyes is expected to make his fifth start this afternoon at Glendale. Luke we have you on record about Daniel Murphy. Luke, some world-class snark there on Murphy. Ha! Jeff, you are so right about Norfolk. I’m going to mimic KK here and say I hope Kieboom the younger’s play will stop talk of acquiring a 2nd baseman. There are a lot more pressing needs. Yeah, the two errors are frustrating to see, but he’s down in Arizona to make those sort of mistakes now so he doesn’t make them in the future. It’s part of the normal learning curve. Besides, we really don’t have any better (realistic) defensive in-house options except Difo, and he has a whiffleball bat.